Lymphoma is the most common blood cancer, with more than 65,000 new cases diagnosed each year in the United States alone. It has taken the lives of such people as former First Lady Jackie Kennedy Onassis, baseball great Roger Maris, country western icon Gene Autry, punk rocker Joey Ramone and flying legend Charles Lindbergh. But lymphoma, in its various forms, still does not receive the amount of public attention or financial support that many other cancers receive. 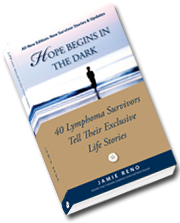 In this first-of-its-kind book, Jamie Reno brings together a diverse group of lymphoma survivors to share their remarkable stories. The people in this book come from all walks of life, but they share a strong will to live and have all made their own informed decisions about cancer treatment. Their stories are filled with courage, compassion, and hope. NEW EDITION HAS JUST ARRIVED! Jamie Reno is a veteran, award-winning journalist with Newsweek. He's also written for the New York Times, Sports Illustrated, Rolling Stone, USA Today, People, Entertainment Weekly, TV Guide, San Diego Magazine and the Los Angeles Times Syndicate. 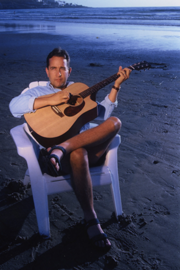 In his "other-life", Jamie is an acclaimed singer-songwriter-guitarist who's recorded and performed with such artists as Peter Frampton, Charlie Daniels, Ricky Scaggs, and members of Chicago, the Eagles, the Allman Brothers, the Beach Boys family, the Little River Band and Steely Dan. And he's an 15-year survivor of stage IV non-Hodgkin's lymphoma. He lives in San Diego with his wife Gabriela and their daughter Mandy. Tell Their Exclusive Life Stories." This inspirational and informative first-of-its-kind book, which is something I’ve wanted to write since I was diagnosed with lymphoma back in late 1996, includes remarkable lymphoma survival stories from athletes, actors, kids, homemakers, CEO’s, rock stars, scientists, authors, soldiers and more. It is my most meaningful lymphoma awareness project yet. When I was told that I had non-Hodgkin’s lymphoma in late 1996, the world suddenly felt like a very dark place. It was a surreal moment when my ear, nose and throat doctor, after doing a surgical biopsy of a walnut-sized lump I had discovered on my neck, came into the recovery room and coldly told me I had lymphoma and referred me to an oncologist. I went into a mild state of shock, followed by some big-time denial. Cancer? Me? I tried to convince myself it was just a bad dream. It wasn’t. My oncologist subsequently concluded that I had follicular, low-grade, stage IV. At the time I didn’t know what any of that meant, but what I did understand is that I had a very large tumor in my nasal pharynx and smaller tumors in my neck, abdomen and groin. It took a while for all of this to sink in. But once it did, with the help of my loving wife, Gabriela (we got married a week before I started chemotherapy), and the rest of my family and my friends, I decided I was going to do anything and everything in my power to survive. The simple reason? I love life with a passion; it’s worth fighting for. Before I started chemo, I desperately searched for a book about lymphoma survivors who’d been through this darkness and made it to the other side. 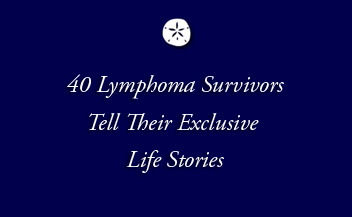 I desperately wanted to read about their specific and diverse strategies for survival, their treatments, their diet, their supplement choices, and how lymphoma had changed them as people. I wanted to read a book filled with success stories. I knew a book like that would be of great help and encouragement to me as I began my treatment. But that book didn’t exist then. When given a lymphoma diagnosis, the people in this book did not crawl into a corner, they chose to stand and fight. Not that they weren’t scared. But they didn’t cower. They took a deep breath, rolled up their sleeves, and prepared for the difficult tasks ahead. Even in their darkest moments, they never stopped hoping. Naturally, no two survivors’ paths are the same, and each of the following stories, while equally fascinating, is unique. I’ve learned something different, and valuable, from each survivor in this book and hopefully you will, too. As I write this, I celebrate 15 years of survival. My original oncologist told me I’d be very lucky to live five years. My first treatment, in early 1997, was a common type of chemo called CHOP with which many of you are familiar. It was rough, but it put me in remission. For a while, anyway. When my cancer recurred two years later, I told my doctor I wasn’t going to do another round of chemo. I told him I was going to enroll in a clinical trial of a then-new, experimental radiolabeled monoclonal antibody drug for lymphoma. He wasn’t sure I should, but I told him I’d done lots of research on this drug – evidently more than he had done - and had concluded this was the best option for me. He reluctantly went along with it. Not that he had a choice, of course. I listened to everything he had to say, then made my decision. I took control of my life. These drugs are saving lives, and now, sadly, they are being threatened for reasons that have nothing to do with how well they work. They need to be saved. If you would like a copy of this book for yourself or a loved one, just contact me directly at jreno@san.rr.com. Meantime, sincere thanks to everyone for your love and support. Be strong, and be well. If you’re scared, just holler and you’ll find it aint so lonesome out there. One hundred percent of the shots you don’t take don’t go in. Be careful about reading health books… you may die of a misprint. Still round the corner there may wait, a new road, or a secret gate.